Qosina offers a variety of non-sterile, single-use safety scalpels that are in stock and ready for immediate delivery. Qosina part #34018 is the revolutionary #15 PenBlade®. Sold per bag of 50, the scalpel's white and green body is constructed of medical-grade ABS, and the blade is high-quality British stainless steel for improved sharpness and durability. The pen-style activation is intuitive, using existing muscle memory (clicking an ink pen), and the release button is positioned near the front of the scalpel, where it can be pressed without looking or repositioning the hand. When the blade is retracted, the end of the PenBlade® forms a suture-trimming groove. This unique patented feature is not available on any other surgical scalpel. Qosina supplies a number of safety scalpels and a wide selection of procedure tray kit components and tools to meet your kit packing requirements. Qosina offers a variety of non-sterile, single-use safety scalpels that are in stock and ready for immediate delivery. Qosina part #34017 is the revolutionary #11P PenBlade®. Sold per bag of 50, the scalpel's white and orange body is constructed of medical-grade ABS, and the blade is high-quality British stainless steel for improved sharpness and durability. The pen-style activation is intuitive, using existing muscle memory (clicking an ink pen), and the release button is positioned near the front of the scalpel, where it can be pressed without looking or repositioning the hand. When the blade is retracted, the end of the PenBlade® forms a suture-trimming groove. This unique patented feature is not available on any other surgical scalpel. Qosina supplies a number of safety scalpels and a wide selection of procedure tray kit components and tools to meet your kit packing requirements. Qosina offers a variety of non-sterile, single-use safety scalpels that are in stock and ready for immediate delivery. Qosina part #31211 is a blue #11 Futura® retractable safety scalpel. Constructed of polystyrene and vinyl, this scalpel is sold per bag of 100 and has a precision stainless steel blade that retracts with spring-retraction technology to minimize the risk of accidental cuts. The locking inset offers tactile and audible verification that the blade has been safely retracted. Qosina supplies a number of safety scalpels and a wide selection of procedure tray kit components and tools to meet your kit packing requirements. Qosina offers a variety of non-sterile, single-use safety scalpels that are in stock and ready for immediate delivery. 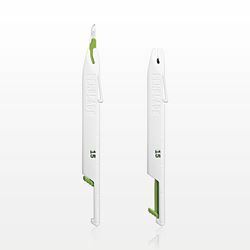 Qosina part #31210 is a green #10 Futura® retractable safety scalpel. Constructed of polystyrene and vinyl, this scalpel is sold per bag of 100 and has a precision stainless steel blade that retracts with spring-retraction technology to minimize the risk of accidental cuts. The locking inset offers tactile and audible verification that the blade has been safely retracted. Qosina supplies a number of safety scalpels and a wide selection of procedure tray kit components and tools to meet your kit packing requirements. Qosina offers a variety of non-sterile, single-use safety scalpels that are in stock and ready for immediate delivery. 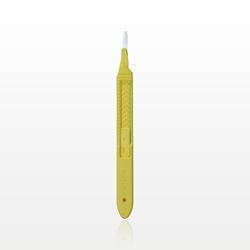 Qosina part #31215 is a yellow #15 Futura® retractable safety scalpel. Constructed of polystyrene and vinyl, this scalpel is sold per bag of 100 and has a precision stainless steel blade that retracts with spring-retraction technology to minimize the risk of accidental cuts. The locking inset offers tactile and audible verification that the blade has been safely retracted. Qosina supplies a number of safety scalpels and a wide selection of procedure tray kit components and tools to meet your kit packing requirements. Qosina offers a variety of non-sterile, single-use safety scalpels that are in stock and ready for immediate delivery. 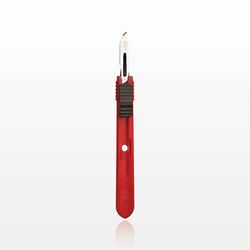 Qosina part #34010 is a red and black #10 retractable safety scalpel that features a thumb slider. The body is constructed of ABS and the blade is stainless steel. Sold per box of 100, this scalpel comes equipped with ribbed, slip-resistant finger grips for a secure hold in gloved hands. Easily opened, with temporary forward locking to prevent accidental retractions, this safety scalpel offers full blade visibility at all times, reducing the chance of accidental injury. Qosina supplies a number of safety scalpels and a wide selection of procedure tray kit components and tools to meet your kit packing requirements. Qosina offers a variety of non-sterile, single-use safety scalpels that are in stock and ready for immediate delivery. Qosina part #34011 is a red and blue #11 retractable safety scalpel that features a thumb slider. The body is constructed of ABS and the blade is stainless steel. Sold per box of 100, this scalpel comes equipped with ribbed, slip-resistant finger grips for a secure hold in gloved hands. Easily opened, with temporary forward locking to prevent accidental retractions, this safety scalpel offers full blade visibility at all times, reducing the chance of accidental injury. Qosina supplies a number of safety scalpels and a wide selection of procedure tray kit components and tools to meet your kit packing requirements. Qosina offers a variety of non-sterile, single-use safety scalpels that are in stock and ready for immediate delivery. Qosina part #34015 is a red and green #15 retractable safety scalpel that features a thumb slider. The body is constructed of ABS and the blade is stainless steel. Sold per box of 100, this scalpel comes equipped with ribbed, slip-resistant finger grips for a secure hold in gloved hands. Easily opened, with temporary forward locking to prevent accidental retractions, this safety scalpel offers full blade visibility at all times, reducing the chance of accidental injury. Qosina supplies a number of safety scalpels and a wide selection of procedure tray kit components and tools to meet your kit packing requirements. Qosina offers several safety scalpel options which include both the PenBlade® line and the Futura® line of scalpels. Our non-sterile scalpels are in-stock and available for immediate delivery. The PenBlade® line is available in surgical blade sizes #10, #11P and #15. The rigid body is constructed of medical-grade ABS, and the blade is high-quality British stainless steel for improved sharpness and durability. The ergonomically designed PenBlade® is tapered for blade visibility. The pen-style activation is intuitive, using existing muscle memory (clicking an ink pen). The release button is positioned near the front of the scalpel, where it can be pressed without looking or repositioning the hand. 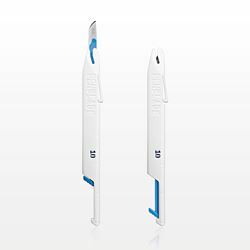 When the blade is retracted, the end of the PenBlade® forms a suture-trimming groove, which encourages the user to finish a procedure in a safe position. This unique patented feature is not available on any other surgical scalpel. The Qosina Full-Line Catalog contains OEM medical device component supplies and features full-scale photographs of thousands of stock components on a one-centimeter grid. Qosina offers low minimums and short lead times on ENFit™ components for single-use systems.